OK, quick question: why did we have to wait TWO YEARS for that boring, dull-as-dishwater, nothing-even-happened episode? Aren't there only six episodes this season? Weren't they supposed to feel like watching a feature film with each episode? What was that? I mean, I don't mind a more character development/exposition-heavy episode, but this was bad. They wrote bad lines and the actors delivered them badly. Why is Arya saying that Sansa's the smartest person she's ever met? Why? No, seriously, tell me. In what TV show does Arya Stark think that Sansa Stark is the smartest person she's ever met BECAUSE IT ISN'T THIS ONE. Who wrote that? They literally have Sansa saying she thought Tyrion was the smartest person in the world like one scene earlier, now Arya thinks Sansa's the smartest? Have the writers seen Game of Thrones? You guys, Arya used to be my favourite part of this show and now I don't even like her any more. Arya, Sansa, Bran and Dany are all playing the same character now; it's that particular kind of bad TV character writing where the idea is to make the person seem clever but they just end up coming off as rude for no reason. Gendry comes to Winterfell, and Arya meets him for the first time in years, and instead of saying, like, "Hello", it's just this awful scene of her being unnecessarily obtuse to him and then leaving. 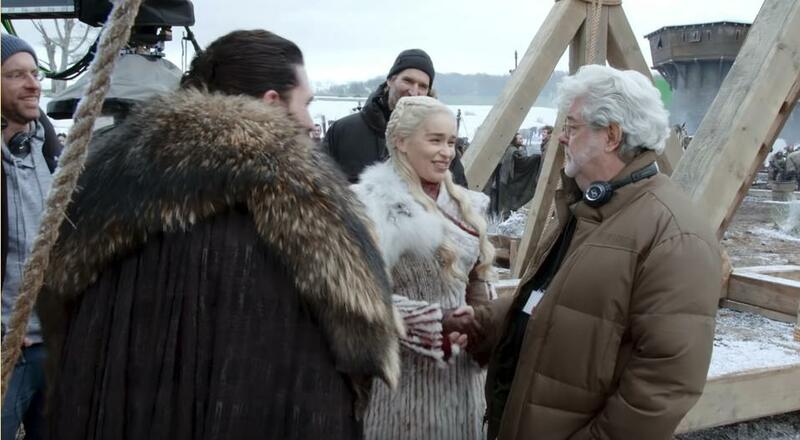 That scene where Jon and Dany ride the dragons just recycles the same joke like four times in a row. Jon is uncertain, then Dany mocks him. OK, that's mildly humorous once, bu- oh, you're doing it again. And again. Oh, and another one. Hey, do you think maybe Jon is nervous about riding the dragon and Dany is enjoying his discomfort? Hopefully the rest of the season is just big battles and CGI, because they have totally forgotten how to do the dialogue parts of this show. There's only one man who could write dialogue this bad. If that broken PNG is who I think it is, then maybe this article is right. Another week, another hour of bad, self-congratulatory, borderline fourth-wall-breaking conversations written by sappy hack writers. There's no sentiment on the internet I dislike more than "Things just ain't what they used to be", but in this case I can't help it: this show used to be way way better than this. When did it all get so bad, bro? Like, what was that Grey Worm/Missandei scene? Someone tell me how a scene so saccharine that the Days of Our Lives writers would have been embarrassed to put their names to it end up on Game of Thrones? "My people are peaceful, we can't protect ourselves." "My people are not peaceful. We will protect you". ABSOLUTE GARBAGE. This show's budget is like a hundred million dollars an episode and I don't believe they spent any of it on writers. That exchange doesn't even make sense; are we supposed to believe that Missandei and Grey Worm's entire cultures are going to move in with eachother? Somehow the Davos/Gilly scene was even worse, though. Did the writer just learn about symbolism that day, from someone who taught it to them wrong as a joke? How do we acknowledge that Davos has some lingering issues about letting Shireen be burnt alive? Oh, I know, we'll have another girl with cabbageface just randomly show up and talk like she's on Sesame Street, and we can have Davos convince her to stay safe during the battle. PROBLEM SOLVED. Character arc complete. No need to mention Stannis or Shireen every again; cross that one off the checklist. Put a bow on it. 10/10 writing. Killing it. Clear a spot on your mantle for the Emmy, baby. When Pod started singing I almost had to turn it off. Thank goodness we have the Ironborn protecting Bran from the Night King, though. 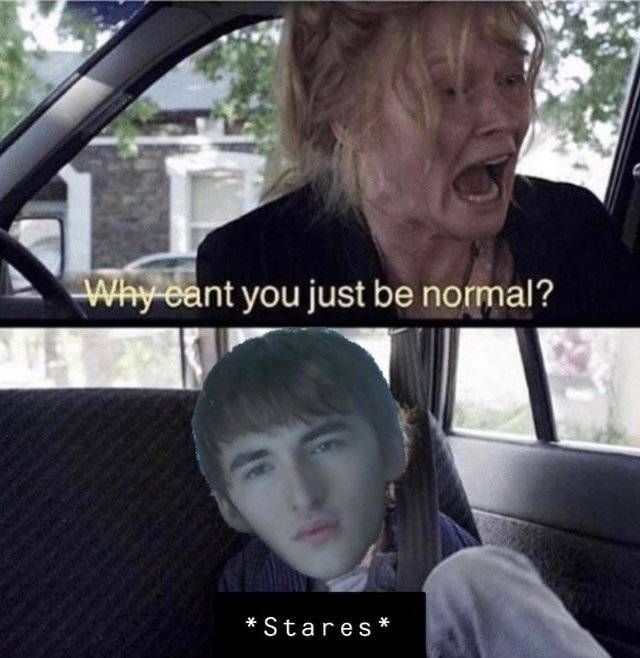 With those cretins on the case, Bran will be dead ten minutes into the next episode and I won't have to put up with him any more. Also I can't believe people even give Jorah the time of day any more, let alone their priceless Valyrian steel swords. Remember when Jorah almost straight up died fighting some nameless goon in Meereen? What do you think he's going to do with it, Sam? Give it to literally anyone else. Remember all those great scenes of Arya learning to be a dead shot with throwing knives and arrows while she trained with the Faceless Men? Ah, those were the- Oh? Hold on, I'm getting a report... yes... yes... Ah, yes, I'm being told that she actually just got beaten with a stick for two straight seasons and then parkour slid underneath an apple cart while being chased by The Waif and none of this Super Arya stuff is earned in any way. I liked this past episode. What a world we live in. The "knighting" scene had me misty eyed, everything with Jaime, Theon, even Arya. I liked Arya's scenes for the first time in what, four years? Five? It was nice. Man, I miss this place. What happened to us? Here be ye dead gifs. May they rest in piece.